Last year, I watched plenty of Nepali play. Such as: Charandas Chor, Degree Maila, Court Martial, Jaar and many more. I must say that Nepali play are setting a unique milestone for the welfare of Nepalese art, culture and tradition. Nepali theatre culture grew further during the Malla period. Malla kings were writers, dancers, musicians and accomplished actors. Pratap Malla ruled Nepal for 50 years (1639–1689). During his reign, Pratap Malla introduced many theatrical performances, which still are part of Nepali festival. The Malla kings were theatre-lovers and practitioners, and drama was performed in open-air stages during festivals. Plays composed by Pratap Malla and Jayaprakash Malla are much loved even today. The above statements will make you clear if you have the curiosity of History of Theatre in Nepal. But, today, I am going to write about an app which gives the latest information about Nepali play, which are playing in different theatres’ in Nepal. 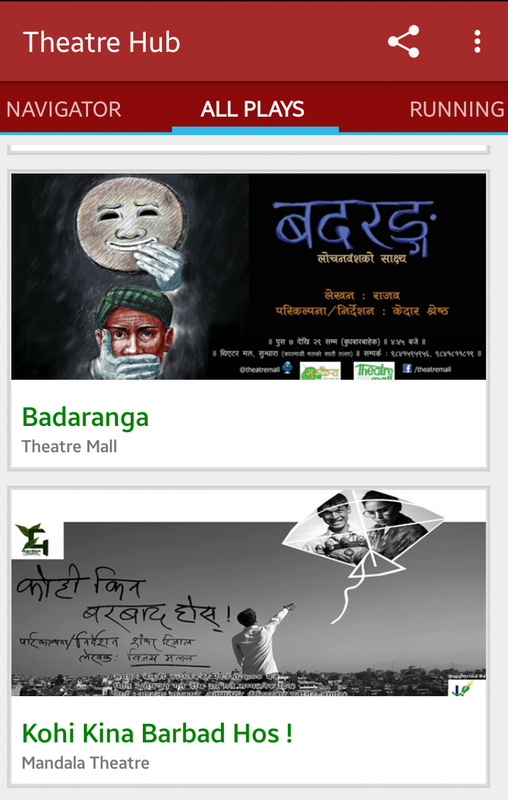 Theatre Hub is that android application which delivers the latest information on Nepali play and share that particular play with your friend circles. Not only this it is meant to provide a platform for theatre professionals and enthusiast in Nepal. Also, to share viewers’ ideas, views, opinions and promote the theatres’ particular events. Though you can book the ticket by calling that particular theatre. But, it would be convenient if there is a feature of online booking. Because, whenever I go to buy the ticket, particularly theatre representatives sell the ticket without knowing the capacity of that theatre which results inconvenience. To install this app you need to check the unknown sources in security options by going to system settings or watch the following video. Hope you will enjoy this app. CHHERS!